Andrew Sugar's fourth entry in 'The Enforcer' series was released in 1973 by Lancer. The entire series was purchased and later reprinted by Manor. All of those reprints featured newly commissioned artwork except “Kill Deadline”. Further, Manor released this novel out of it's original series order, confusing readers by stamping #6 on the cover and misspelling the author's name. For those of you unfamiliar with the series premise, I highly recommend clicking on the Enforcer tag below to better understand why this vigilante series contains science-fiction elements. While not a traditional vigilante yarn, the idea of a company, such as Rosegold Institute, financing a war on crime certainly dresses the part. 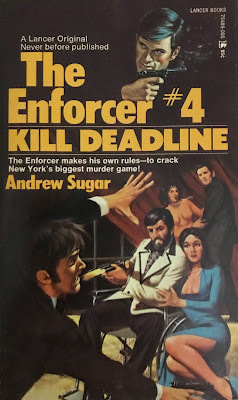 “Kill Deadline” expands on that formula and offers a fairly simplistic mystery for readers to digest. The premise is that a wealthy entrepreneur is being assassinated on the tenth of each month by The Calendar Killer. These corporate executives represent successful companies that have refused to sell out or cooperate with the Mob. The latest victim is a friend to the institute, Daniel McBane. Upon his assassination, the company's controls are willed to Richards, who was injured during the murder. Our favorite “enforcer”, protagonist Alex Jason, conceives the idea of replacing Richards with a clone body that Jason inhabits. The mission is to lure the assassin out into the open so Jason's skill-set can capture or kill the hitman. Like the book's opening pages, which promises an inevitable confrontation between Jason and his nemesis Lochner, the mystery is fairly simple – locate the hitman and the eventual connection between his organization and Lochner. Along the way Sugar's writing introduces some new allies while surprising readers with a shocking death (that even I had to read twice!). Overall, this series is a brilliant undertaking and a really clever spin on the 70s men's action adventure staple. While it was short-lived, at just six total books, this author makes the most of the concept and writes spectacular fiction that is overwhelmingly entertaining. This is a mandatory read for action enthusiasts.